Certificate of Conformity GOST R (it is often called ROSTEST Certificate or Quality Certificate, Safety Certificate, Customs Certificate) – is a document, confirming that the product answers the requirements of quality and safety, which were adjusted for a certain kind of product by valid standards and norms (national standard (GOST, GOST R, GOST R MEK, GOST R ISO and others)). Earlier you only needed to have the certification for the national standards (GOST). Today you also need to have a certification of the Technical Regulations as well. Certificate of Technical Regulations (recently added). “Technical regulation on lifts safety” (such as a certificate for passenger lifts). Procedure “Mass Production” or “manufacturer”. The duration of the Certificate of GOST can be from 1 to 3 years, the Certificate of Conformity to the Technical Regulations – from 1 to 5 years. The manufacturer gets this certificate once, and during the term of the certificate can provide a copy to any Russian customer/ buyer for any kind of consignment. The number of shipments to Russia is not limited. Procedure “to single samples of production or to small lines” – is designed for a single batch of a certain size. This procedure is convenient in the case of a (single) supply. 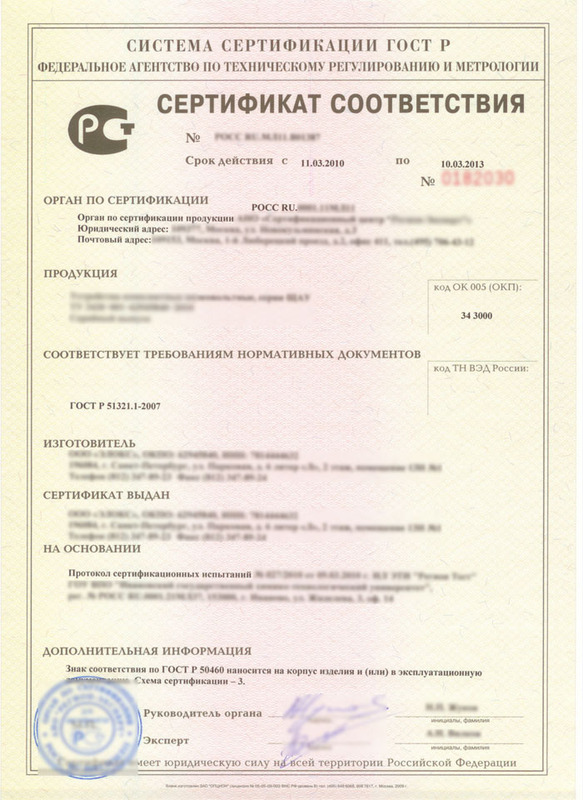 Certificate is issued for a certain Russian recipient, with an indication of the contract, invoice and consignment size. Certificate “to the party” has indefinite duration, as you can use it only for one certain shipment, and for another one it is no longer valid. Usually, the certificate is worth less than a procedure “to mass production, but has some limitations. The way of getting a Certificate GOST R is the following: production (some items or technical document) must pass certificate examination in accredited laboratory. Russian standards of conformity can be confirmed without product samples only on the basis of specific documents. If a foreign manufacturer already has some of his certificates of quality, they can check their conformity to Russian norms and regulations. According to the results of tests they compose protocol, which is a ground for giving a conformance certificate GOST R.
To obtain the Conformity Certificate GOST R as well as information about the time of processing, costs and list of documents which are needed to obtain these certificates, you must provide information about your product.